If you want to shop online, click above to see my shop at Etsy.com. The Etsy shop has current items that are ready to ship. Fully functional for brewing a small cup of tea, these miniatures teapots can also be used for cream, dressing, soy sauce, syrup, etc. Dishwasher and microwave safe. Small but very noticeable. 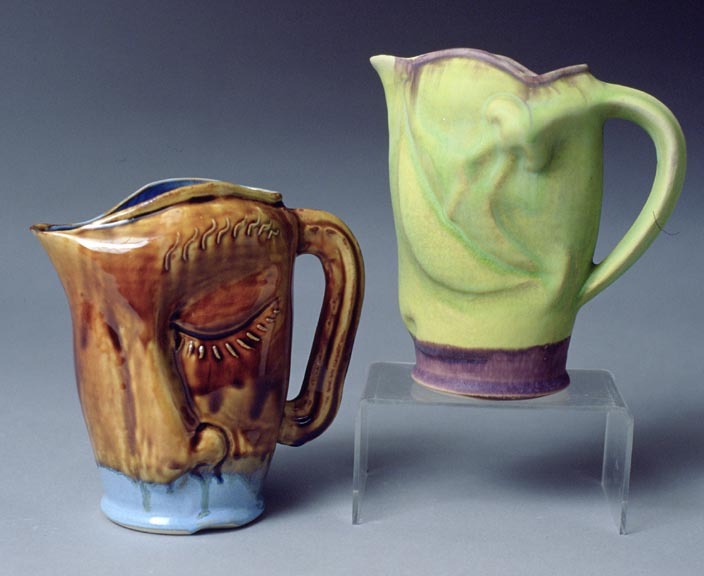 Porcelain Pitchers: Wonderful for iced tea, lemonade, or Sangria. These also make wonderful flower vases, for a spectacular room accent. These Salt & Pepper Shakers are sweet! 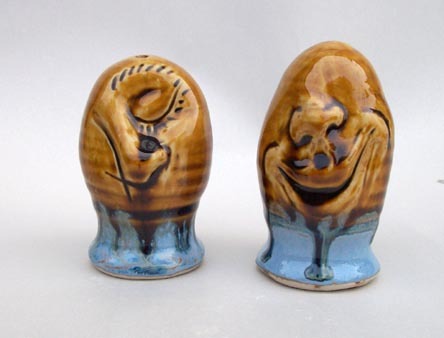 Full of character in a small package, I call them Smile and Peeper Shakers. You'll keep on the table for company. 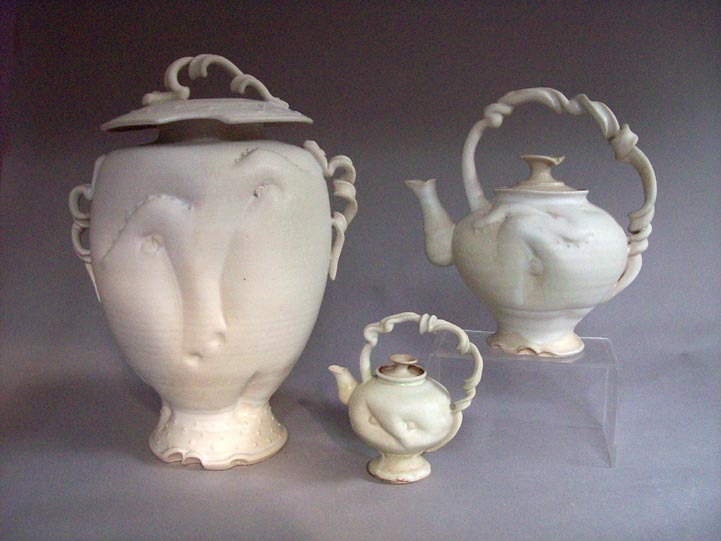 Porcelain Teapots: regular teapots are 8 inches high. 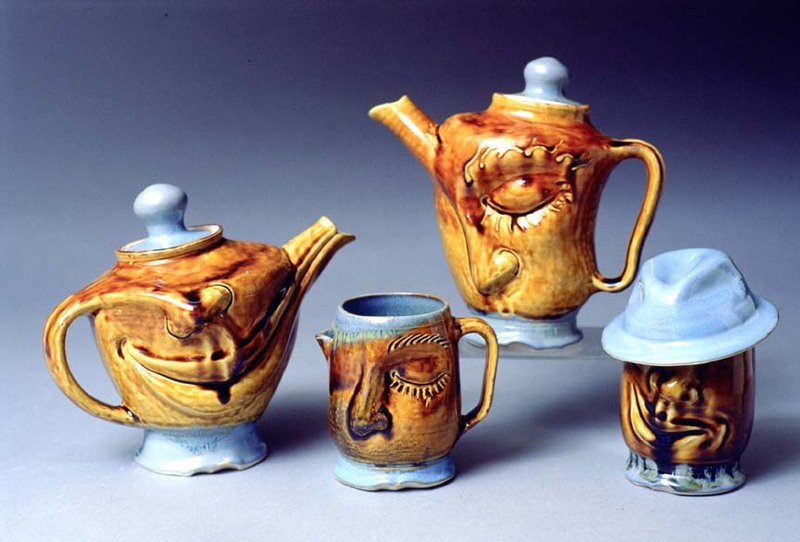 These are fully functional for brewing tea. 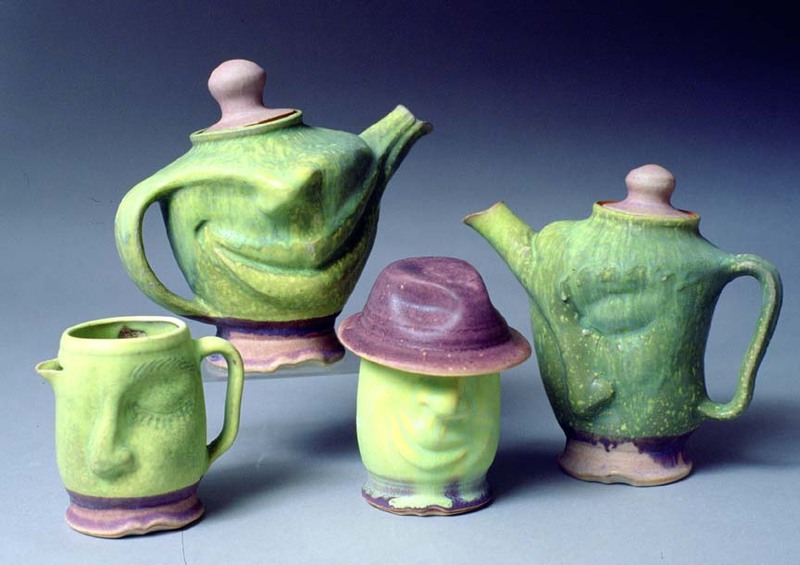 The faces on these teapots are full of fun! The creamer and sugar (with hat) make a complete set. See mugs for more fun. 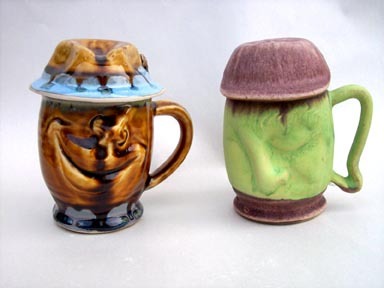 Mugs can be bought with hats to keep you java or tea warm, or without the hats. Add a smile to the morning! Give these to your friends, and they will remember you every time. Plates and Platters: The large platter is 15" across, and has a hook ring on the back for hanging, and is fully functional for serving the main course or a plate of hors d'ouvres. The sun plate is a decorative item for the wall, as is the Man in the Moon. The Curly plate is a wonderful serving dish, and hangs on the wall like the platter. Ikabana holder: In the time-honored Japanese tradition of flower arranging, these vessels come with a pin frog for your decorating ease. Place two or three flowers from the garden in this container for a bright spot in your house. White is in! 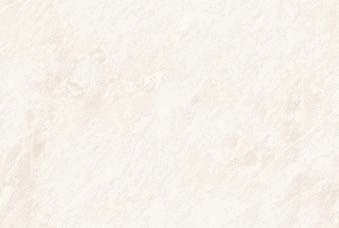 This a new line that has been ordered by national craft galleries. It's so new, I haven't gotten a full set of photos yet. Let me know if you like it!